Famous for their acrobatics, humpback whales carry out a range of spectacular behaviors in play, communication, parasite removal, and to express excitement or annoyance. These behaviors include breaching, lobtailing, and flippering. The scientific name for the humpback whale means "great wing of New England" and with flippers up to 15 feet long—about one-third the length of their bodies—it's clear to see how they got their name. Its huge flippers help distinguish humpbacks from other whales. These creatures average 45 feet in length. 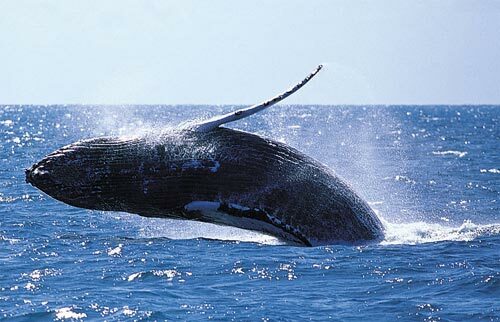 Female humpbacks tend to be larger than males. Humpbacks have black dorsal sides, white, black, or mottled undersides, and white or black flippers. Humpback whales make a wide array of sounds from trills and chirps to groans, moans, and roaring. By combining sounds, the males form complex and hauntingly beautiful songs in their efforts to attract mates or warn off other males. Humpback whales live throughout all the world's oceans. They migrate large distances from their spring through fall feeding grounds at the edges of the polar ice to their winter calving grounds in tropical waters. Humpbacks have a generalist diet, feeding on krill and various types of small schooling fish such as herring, capelin, sand lance, and mackerel. The social organization of humpback whales is characterized by small unstable groups. Individuals typically associate with many companions on both feeding and breeding grounds. Males and females become sexually mature at age five. Mothers give birth in midwinter after an 11-month gestation period. Calves begin to feed independently after six months, but continue to nurse for about a year. Listed as an endangered species today, humpback whales are protected from commercial whaling. For several centuries the whaling industry heavily exploited these animals. Some populations decreased by 90 percent during the most intensive whaling periods. Though whaling restrictions have helped humpback populations recover in many areas, numerous whales die each year from entanglement in fishing gear or collisions with ships.